Chop onion, mushroom’s stems and mix with minced garlic; add Salt and white pepper. Stir together chopped onions, garlic and mushroom’s stems over a low heat until softened and slightly browned, about 5 minutes. Prepare sauce: in preheated pan add flour and gradually whisk in heated milk, in order to make a roux, and then cook under gentle heat while stirring with a whisk. Cook until the souse thickened and smooth. Fill mushroom caps with stir fried onions-mushroom mix, then with milk thick sauce and on top place small slice of Emmental (yellow) cheese. 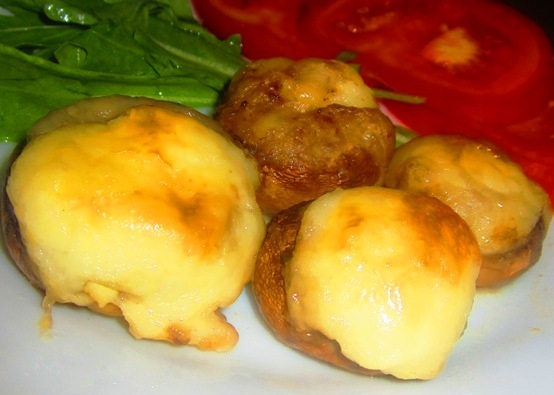 l love stuffed mushrooms, these sound delicious! I haven’t made this before but want to try it. I’ve never seen mushrooms in rings like that but it would make it much easier to stuff!